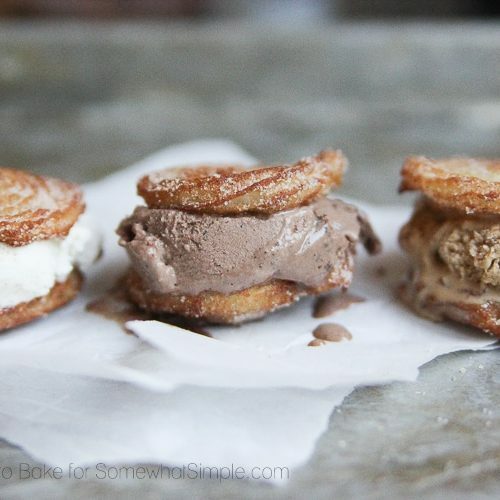 How cute are these delectable desserts?! 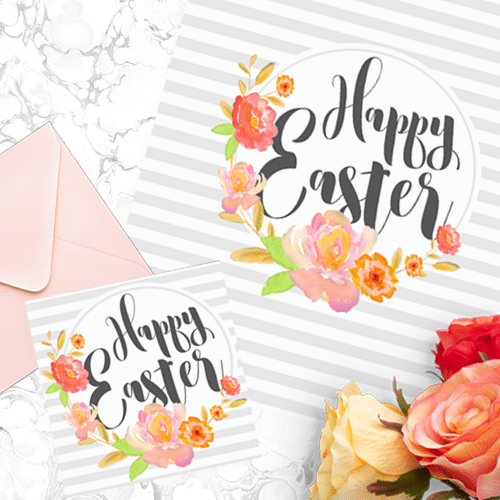 These darling treats are surprisingly simple to put together, but they’ll impress everyone who sees them! You can use homemade sugar cookie dough, or you can buy it ready-made from the store. 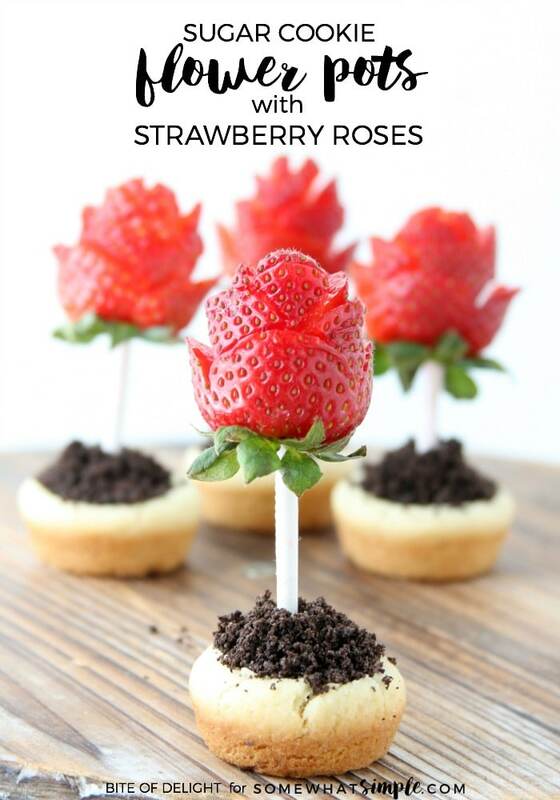 The strawberry roses are simple to make. The only equipment you need is a sharp paring knife. 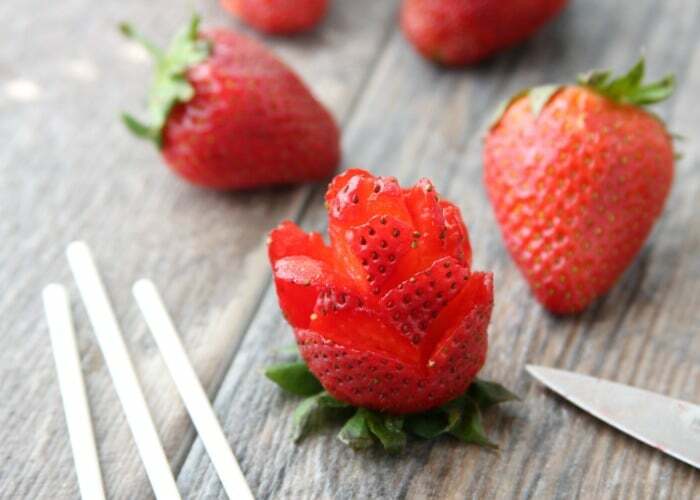 With just a few cuts, you’ll have a simple but beautiful fruit flower! Grease a 24 count mini muffin pan. Scoop approximately 1 tablespoon of cookie dough into each cavity of the muffin pan. Roll and gently flatten each dough ball. Bake for 10-12 minutes. While cookies are baking, heat heavy cream just to a boil, then pour immediately over the chocolate chips. Let sit for 2-3 minutes, then stir. Add the peanut butter and nutella and stir. Pour the warm ganache into a quart-size zip top plastic bag. Remove the cookies from the pan onto a large plate. Snip one corner of the ganache bag and pipe the warm ganache into each cookie cup. Top with Oreo crumbs to resemble dirt. 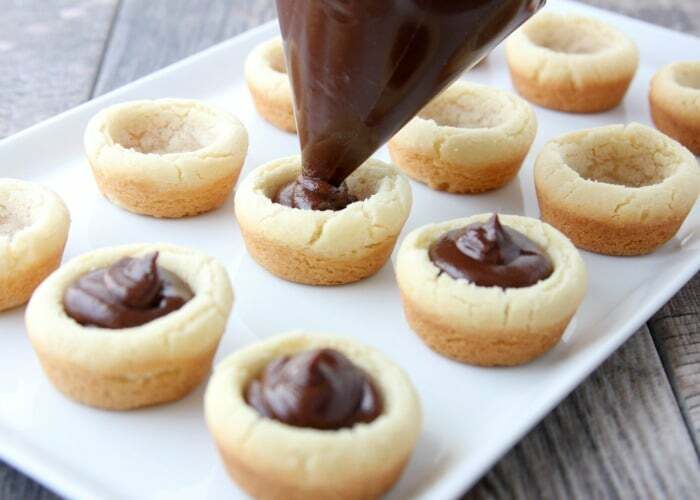 Place the ganache-filled cookies in the refrigerator to cool and set. 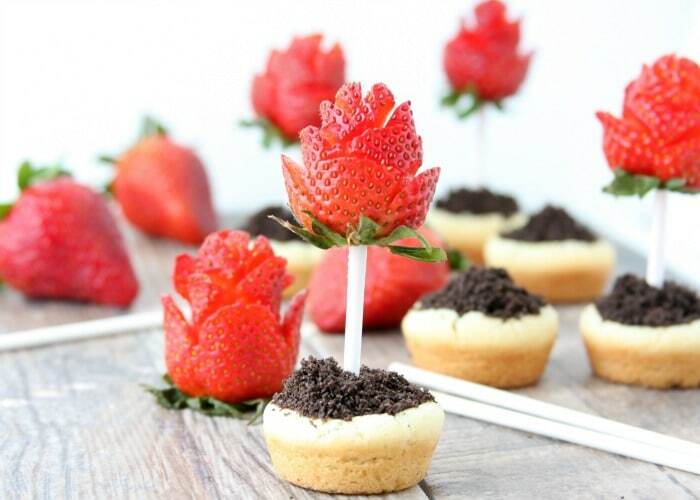 While the cookies are cooling, cut the strawberries into roses. Place the strawberry tip-up on a cutting board. Take a sharp paring knife and, starting about ⅓ of the way up from the base of the berry, cut 3-5 petals (depending on how big around it is). Slice down, but not all the way through, then gently bend the “petal” outward. Repeat for the middle ⅓ and top ⅓ of the berry, starting each new row of “petals” offset from the row below. Insert a sucker stick into the base of each strawberry, and push up through until it is approximately ⅔ of the way in. Insert the bottom end of the sucker stick into the set ganache and then serve immediately. I tried baking the cookie dough unrolled (straight from the scoop), but for the recipe I used (which doesn’t spread much during baking), the end result was much better when I rolled the dough in my hands to smooth it out. 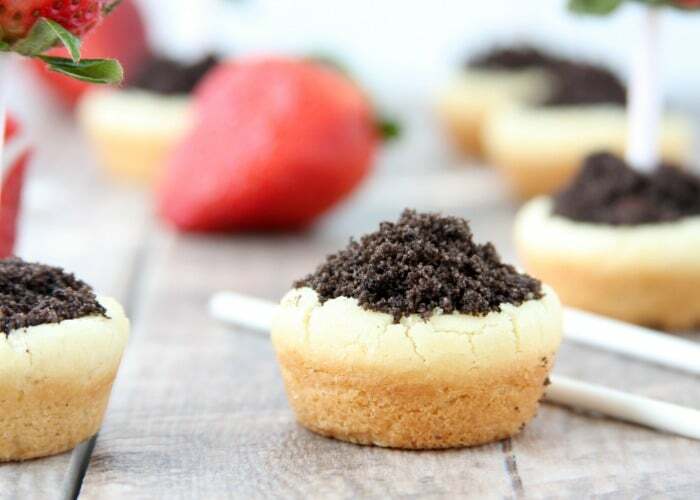 If you use this recipe, be sure to substitute vanilla for the lemon extract.There are several ways you can slice a strawberry to look like a rose. If you prefer a different look, use your preferred method. As the ganache warms, it will soften slightly. The strawberries may start to lean if the ganache becomes soft. I like to keep them in the fridge until I serve them to keep the ganache cool and firm. Short, plump strawberries are better for roses than tall, skinny strawberries. These are awesome! 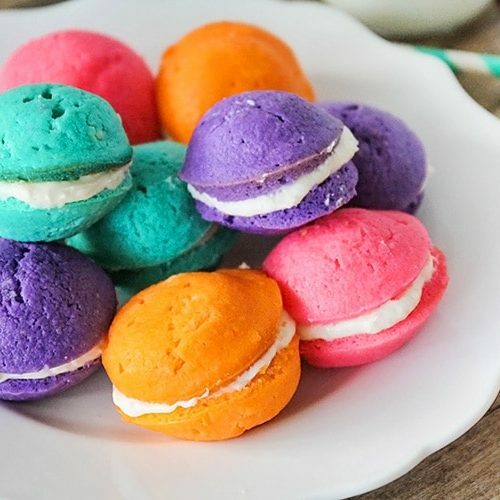 I’m going to try to make them with my daughter!